Press Release: 10 MEPs call to re-establish the Intergroup on Ageing and Solidarity between Generations – "The Europe we want is for all ages"
On 15 October, 10 MEPs joined an event hosted by MEPs Heinz K. Becker (EPP, AT), Josef Weidenholzer (S&D, AT) and Ivo Vajgl (ALDE, SI) to call on political groups to re-establish the long standing Intergroup on Ageing and Solidarity between Generations. This key EU forum is more than ever needed to prepare for Europe’s demographic change and meet the objectives recently set by the EU institutions in that area. Addressing the challenge of demographic change in Europe, President-elect Juncker has asked the designated Commissioner for Employment, Social Affairs, Skills and Labour Mobility, Marianne Thyssen, to ensure that the impact of ageing is “appropriately taken into account in all Commission proposals and activities.” The European Parliament playing a key part in EU decision making, the Intergroup on Ageing and Intergenerational Solidarity brings an effective contribution to the EU debate on ageing issues and can help shape relevant EU policies. For that reason during an event organised at the European Parliament yesterday, 10 MEPs coming from 5 political groups called on all political groups to support the re-establishment of the Intergroup on Ageing and Solidarity between Generations. Founded in 1982, the Intergroup on Ageing and Solidarity between Generations has been a key factor of progress in the past decades to improve Europeans’ quality of life. During the last term, it gathered some 40 MEPs coming from all political groups and committed to find positive solutions to the challenges of demographic change. It organised more than a dozen of events and has been active on a large range of policy areas. During yesterday’s event at the European Parliament, Heinz K. Becker, Josef Weidenholzer, Ivo Vajgl were joined by Jean Lambert (Greens, UK), Lambert van Nistelrooij (EPP, NL), Eduard Kukan (EPP, SK), Brando Benifei (S&D, IT), Ana Gomes (S&D, Arne Gericke (ECR, DE) and Marian Harkin (ALDE, IE), to support this call. The Intergroup has also already been supported by Claudia Monteiro De Aguiar (EPP, PT) and Francisco José Millan Mon (EPP, ES). 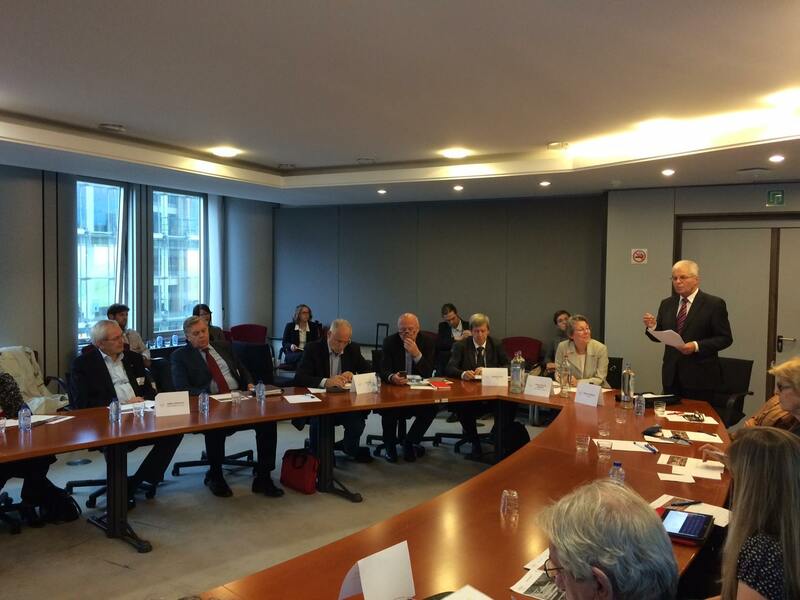 You may read MEP Ivo Vajgl article on the event (in Slovene) here. Photo courtesy of Ivo Vajgl. Next Support the re-establishment of the Intergroup on Ageing and Solidarity between Generations!